Erôn-Khorlöth; which means “Castle Strong-Fist" in elvish, is a large, ancient fortress which now serves as the headquarters for the Veiled Society. It is located on the northeast coast of the Isle of Cynara; is nestled atop a tall cliff overlooking the Sea of Vaas. At the base of that massive cliff is the large coastal town of Swanford. The castle, and the town that it overlooks, are both located on the eastern edge of the Forbidden Forest. This ancient castle was originally built in the First Age by the Silvar-Elves. The castle served as an important northern outpost of the elf-realm of Ectharë. In the Second Age, it played a role in the War of Wrath as an vital strategic base of operations for the Silvar in their wars against the Dark-Elves. The castle was under siege for nearly 60 years by an army of Drow and their hired troll mercenaries. Eventually the fortress was captured and burned. Never again did the elves of Corwyn try to reclaim it and for many centuries the fortress was nothing more than abandoned ruins. In the Third Age, the Isle of Cynara was home to several human tribes called the Cynarans. These northern people were ethnically similar to the Vaas and had a well-deserved reputation as fierce warriors and great sailors. After a long campaign, The Cynaran tribes became united under a single banner in the year 846/3. The man who united those Cynaran tribes was King Endacil Redmond, who founded the Kingdom of Urland, and became its first ruler. King Endacil chose to rebuild the ancient elven fortress of Erôn-Khorlöth and make it his royal home and the center of Cynaran power. He ordered the ruins rebuilt, and a great hall erected. Within that hall was placed the famous Redstone Chair; the throne of Urland, which became the seat of the House of Redmond for more than 300 years. From this castle the kings of Urland consolidated their power and expanded Cynaran holdings to include not only the Isle of Cynara, but most of present-day Derianor, and the northern third of Westvale Island. Everything changed in the year 1137/3, when Ilnavel Cyrenäe and his fleet of 1,000 ships arrived on the shores of Westvale Island; bearing the 40,000 Iskari survivors of the Doom of Iskandar. Soon after, the Iskari and the Cynarans came into conflict for control of the Westvale. This bitter conflict became known as the Forty-Years War. It was Ilnavel and his Iskari who prevailed in that war and the Cynarans of Urland were conquered. In the year 1171/3, Ilnavel laid siege to Erôn Khorlöth during the Battle of Swanford. Eventually, the castle was captured and burned and King Narmacil Redmond; the last Cynaran ruler of Urland, was slain. For several centuries afterward, the castle was intentionally left in ruins by the Iskari, as a stark reminder not to rebel against Cyrendar. After several centuries in ruins, the castle was again rebuilt and came under the control of the House of Strongfist; the ruling noble family of the Duchy of Cynara. This duchy was created as an Iskari vassal state to rule the Isle of Cynara in the name of the Iskari Kingdom of Cyrendar. The Strongfist family was appointed by the Royal House of Cyrenäe for their supposed loyalty and their ability to control the local Cynaran population. But, alas, Cynaran loyalty was not what it seemed. Under the leadership of Duke Teraxas Strongfist, the Cynarans rose in bloody revolt against the crown in the year 1068/4. Thus began the long and terrible Iskari Civil War; which raged for twenty years. Finally, in the year 1087/4, the House of Strongfist was destroyed and the Cynarans beaten into submission by the armies of King Ikharos Blackburn. Ikharos ordered the fortress burned for the third time in its history. The charred stones of, what at that time was called “Castle Strongfist,” remained in a complete state of ruin for many centuries afterward. Erôn Khorlöth sat empty and abandoned until the early years of the Fifth Age, when it was taken over and rebuilt by the House of Ilros Tarbeck, a petty noble family from northern Cyrendar who bought the lands and the castle as a testament to their wealth and vanity. The Tarbeck family had no better luck with the castle then any of its previous inhabitants. Soon thereafter, a vicious basilisk turned all its inhabitants into stone statues, and the castle was once again abandoned. Even today, the statue of Ilros Tarbeck can be found standing on the castle grounds. 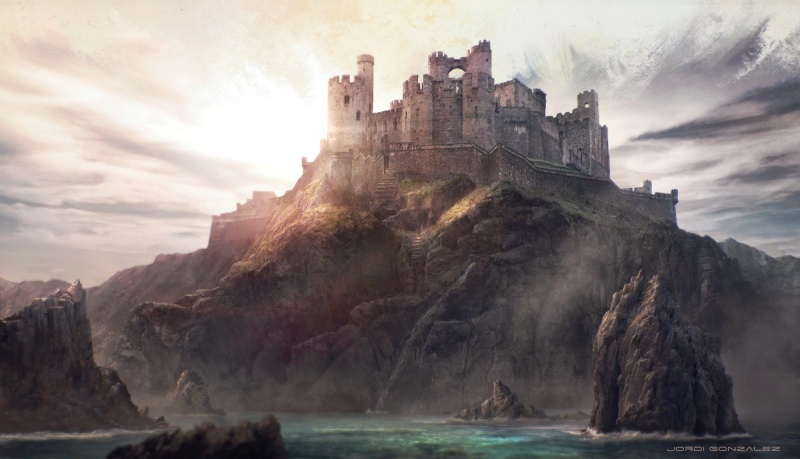 Some say he was a victim of his own greed and pride, others say he was a victim of the “curse of the castle;" a recurring legend because so many ill deeds took place here over the castle's long history. When the Tarbeck family was destroyed, the castle became abandoned again and it was generally avoided by the local population. The castle would not become occupied again until many years after the Cataclysm. After sitting vacant for several centuries, the fortress was rebuilt once again the early Sixth Age. This time, its new owner was the mysterious and powerful Veiled Society, who rebuilt the fortress and greatly expanded it over the centuries. The Society made several important changes. First they took the scattered statues of the Basilisk’s many victims and placed them inside and around the castle as macabre decorations. 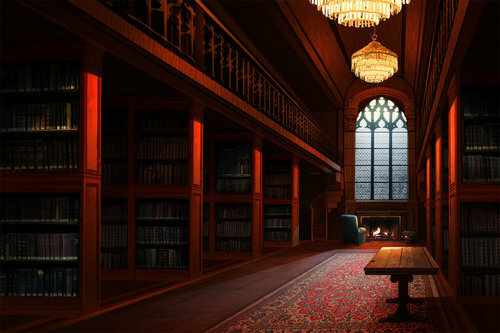 The society rebuilt the great hall, and removed the Redstone Chair of the ancient kings of Urland. The Society also built or expanded several other buildings on the castle grounds: including a large library, student dormitories, an astronomical observatory, and most famously, a huge white tower in the center of the fortress. This slim, stone minaret was simply called “Hightower,” and became the inner sanctum of the Veiled Society and the most famous and iconic structure of the castle. The building was completed entirely with magic, so it is much larger within than its outward appearance. The tower is over 300 feet high, making it one of the tallest structures anywhere on the continent of Corwyn. Today, Erôn Khorlöth is restricted to Magisters of the Society and select, invited guests. To protect its seclusion, the wizards of the Society have erected a permanent wall of force around the perimeter of the castle, and in front of its massive bronze front gates lie two giant Chimera statues, which come to life and instantly attack any persons nearby if the proper passwords are not uttered. The fortress is garrisoned by Paladins and warrior-priests of the Order of Inquisitors. These guards have a well-deserved reputation for their deadly skills. Once inside, the castle is a labyrinth of secret passages, wizard-locked doors and invisible portals to other planes and distant realms. Not to mention that the Wizards of the Society will attack any trespassers on sight. 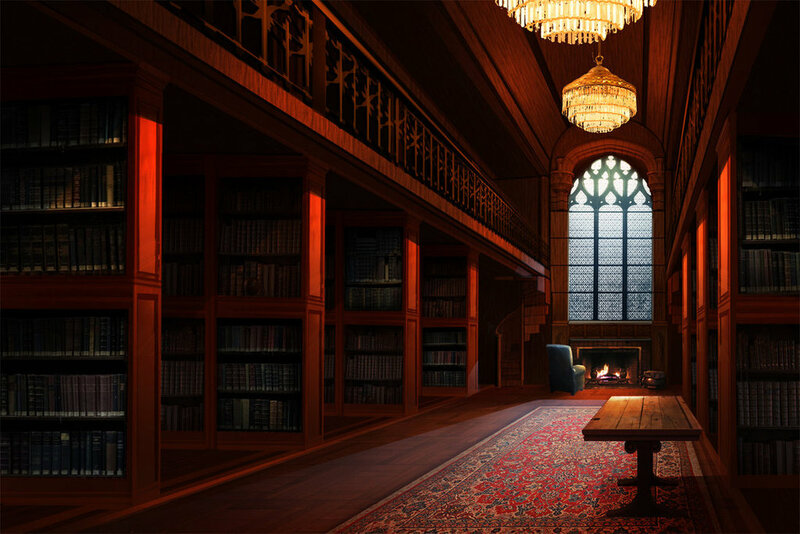 The castle is home to many great libraries and magical laboratories, as well as vaults of magical treasure hoarded by the Society. If the castle and the Society were ever threatened by a force so powerful that they feared defeat, the Magisters would call upon their oldest ally. This ally is none other than the Great Wyrm Calefax; an ancient and powerful Gold Dragon who helped found the Veiled Society more 1,200 years ago.